Did you know? It is estimated that in the U.S. every year 2 Billion disposable razors are thrown away! It would have to be similar in Australia too. All that waste, not to mention all that money we spend on disposable razors adds up! Which is why we are now stocking a range of Safety Razors and blades for both women and men which are suitable for legs, armpits and face! We can get our hands on a disposable razor for just a few dollars. You’re probably purchasing a pack of 3 razors say every 3-4 months. That’s $10 – $15 for a 3 pack which is around $45 for 9 razors that go to landfill in one year. If you’ve got a partner or house mate that’s doing the same $90 and 18 razors. Safety razors can work out to be a little more costly upfront. $50 will get you a Safety razor and a 5 pack of razor blades. 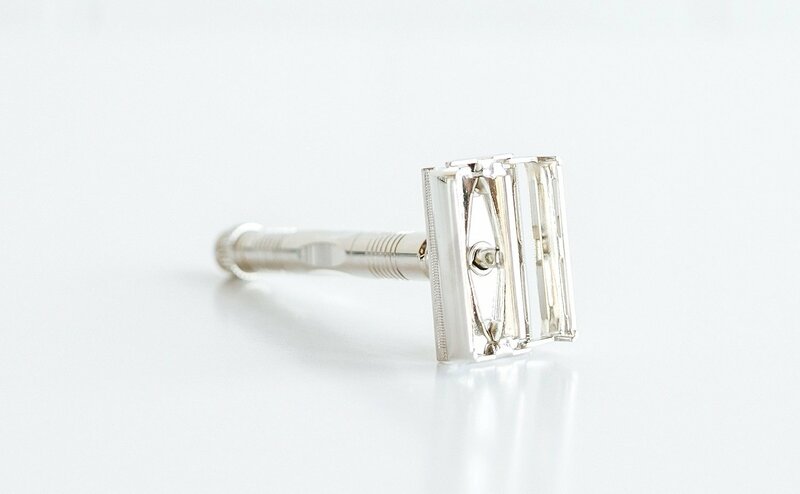 The safety razor will last you a lifetime when looked after and a 5 pack of blades (depending on how often you shave) should last 3-6 months. 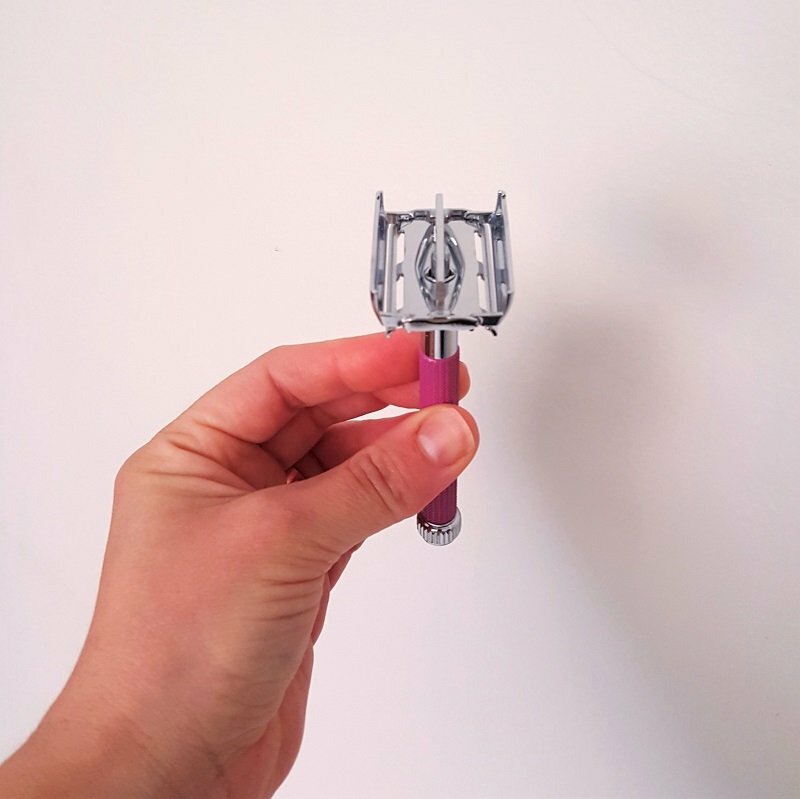 I LOVE my comb safety razor and while I don’t shave my legs every day (maybe once a week) I still haven’t changed my razor blade from April as it’s still sharp. It took me about 2-3 shaves to work out the best way to use it – the angle to shave at, how much pressure to apply etc. I have heard a few people mention they’re a little scared of the how sharp it is and the thought of using a safety razor. It is so easy to use and the nicks I got would’ve been the same nicks from using a sharp disposable razor. Two main differences with the razors we have in stock – butterfly and comb. This refers to the opening of the safety razor which is where the razor blade goes in. Butterfly – uses a twist mechanism at the bottom of the handle to open the top where the blade goes – all one piece. Both are super easy to adjust and fit the blade so the main choice would be the colour or handle you like. 2. Go slow – give yourself a little extra time for your first shave. This helps you to understand exactly how the razor works, how much pressure you need to apply and what angle to shave at. 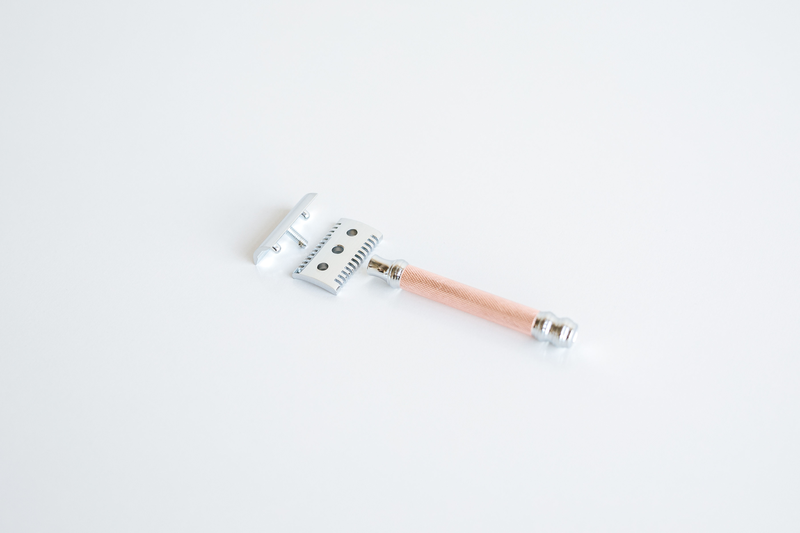 It is heavier than a disposable razor which helps with a closer shave and means the safety razor does the job for you. – Disposal of blades – you want to be careful and mindful when disposing of razor blades. I’ve seen people using a blade bank – this can be an old tin or soup can to pop the blades in. Make sure you have it clearly labelled. Once full they recycle them. Alternatively, wrap them back up in the waxed paper they come in and then in newspaper to dispose. If you’ve got any questions about these please email me – info@babsbodycare.com.au. They are seriously easy to use and are nothing to be scared of. The amount of plastic and waste it saves me from creating, along with the amount of money I save AND the extra time in between shaves makes it so effective. It’s a WIN WIN. Shop Safety Razors here and razor blades here. As a side note – I haven’t travelled with mine yet and I would only take it away with me on a week holiday and so it would be fine in checked baggage. I’ve read about taking the razor and blade apart, makes it easier/safer to travel with. But I’d get in touch with the airline if you want to take it on carry on. Which natural deodorant is right for me?